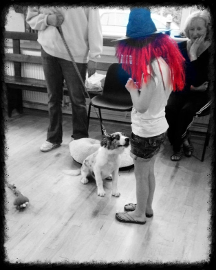 Fun, reward-based classes specifically designed for young puppies 20 weeks & under. 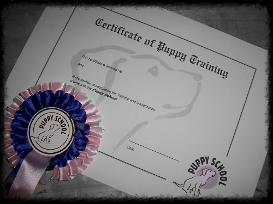 You will receive the 'coveted' Puppy School certificate & rosette for completing the course! How old does my puppy need to be to attend classes? We believe in the benefits of early socialisation so as long as your puppy has received at least his first vaccination and has been cleared by your veterinary surgeon to attend, he can begin his Puppy School education straight away! 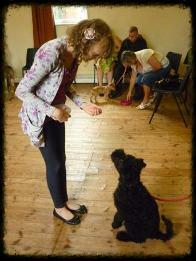 your tutor will guide you clearly through each exercise, offering individual help & advice where required. How many puppies will be in our class? Class numbers are kept small; no more than 8 puppies as an absolute maximum to ensure individual help & attention can be given. 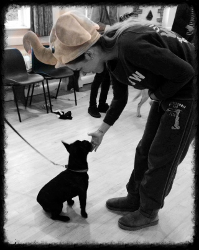 We only use positive, reward-based methods using food & toys to motivate puppies at our classes, any negative or punitive actions will not be allowed or tolerated by your tutor. What will my puppy learn at classes? How to settle and much more! Puppy School from Puppy School on Vimeo. 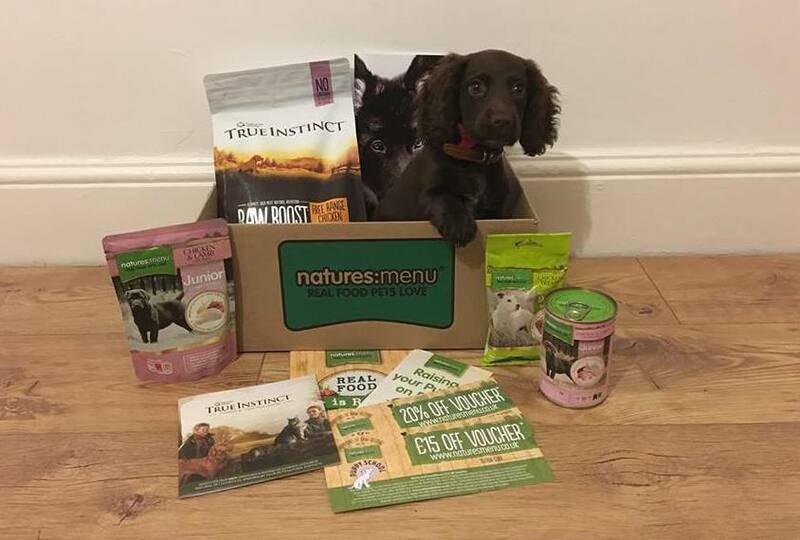 Upon signing up for Puppy School, owners will now receive a **FREE** Puppy box from our sponsor, Natures Menu worth over £20!! Owners will have the opportunity to purchase invaluable training aids, toys and books at classes- all invaluable in helping you teach your new puppy essential 'Training for life' skills. 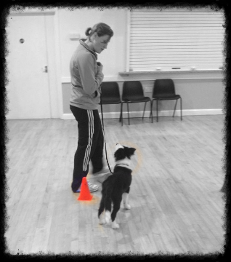 Exercises progress gradually over the sessions to further your puppy's knowledge & development. Each puppy will learn at a different rate so there is no need to feel pressured if yours takes a little longer to grasp it, and owners will never be singled out or shamed in any circumstances. The cost of the 6-week course including: certificate and rosette, Puppy School training manual, Natures Menu treats, and £15 off Natures menu voucher is £70. (+ £1 booking fee) Book online via Worldpay below. Our courses run on Tuesday evenings at 7:15pm at Bradley Green Village Hall, nr Redditch and Thursday evenings at 6:00pm at Oakenshaw Community Centre, Redditch, and Saturday mornings at Arrow Village Hall, nr Alcester. Click here for full location details. Each class lasts for one hour. *Saturday 27th April @ 10:00am (Bradley Green with Kate & Emma) JUST ONE PLACE REMAINING (For pups born on or after 8th December 2018) *No class 11th May- course finishes 8 June. New courses begin approx. every 3 weeks. 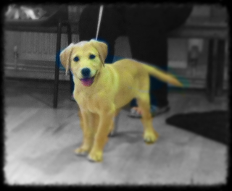 Please bear in mind we tend to book up very quickly and you only have one chance to enrol at Puppy School, so don't be disappointed, book today! Puppy School is specifically designed for puppies 20 weeks and under on the course start date- please be aware of this before making a booking. Full refunds can only be given for cancellations giving at least 7 days notice prior to course start date. Cancellations within 7 days of start date will be subject to a charge of 100% of fees paid unless place is re-filled up to 48 hours prior to start date, in which case a full refund will be given. If payment is not made within 48 hours of receiving the email with payment link to Worldpay, the place will be released and shown as available on the website. Click on the link below to be directed to the main Puppy School website for further information on course content, choosing your new puppy, our other tutors and founder, Gwen bailey. 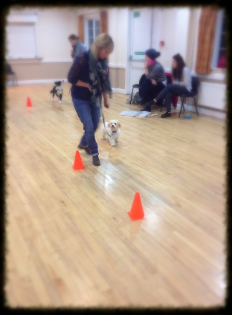 "Vicky was very friendly and helpful and you can tell it's not just a job, she really cares for the dogs in classes and has their well-being at heart. 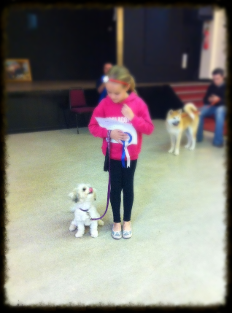 Thanks"
"You soon realise that this class does not train your puppy, but trains you to train them for the future! Very worthwhile, Thank you"